We are going to go pretty heavy into Geography this year for school. I have found some great products that really tie in with learning about other countries and their cultures. A great tie in we were able to review is from Gryphon House , publisher of early education resources. We are going to be hopping from one country to another through other various resources and we love to tie in artwork and additional cultural experiences. 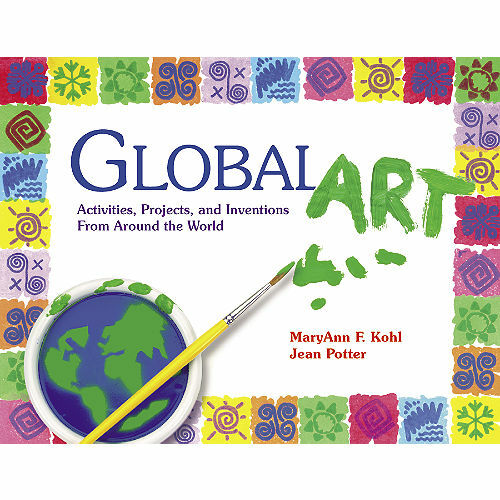 Global Art ($16.95) does just that! Geared for kindergarten through fifth grade aged students, Global Art fits in perfectly with our upcoming school year. We were able to do a few of the crafts over the review period and briefly learn about the country where the craft originated. The book is organized by continent and then by country, each giving a glimpse of the original art form that the craft is modeling. We started our journey in Central Africa making traditional necklaces. The boys didn't have any trouble with it, we chose not to focus on it being a traditional Women's necklace! Our next stop was North America where we took some butcher paper and made Hands Across America Paper Dolls. Mine didn't turn out but the kids managed to figure it out! These would be really fun to try a variety of shape with. Shiloh even tried making paper giraffes.. yep we need to work on that one! We ended up in Fiji where we learned about a man who raises pet cod fish! They come to the surface to be fed and actually pet! Very interesting tid bits! Shiloh made a Stuffed Cod Hanging to remember Fiji and our interest in learning more about the island. I did struggle with some of the items needed for the projects simply because I live in a small town and don't have a hobby or craft store near by. What I plan to do for the upcoming year is to organize the supplies we need for each month and either order them online or head to one of the bigger towns that has a Hobby Lobby to stock up. All things you can easily find and plan to have ahead. We will clearly know from month to month what countries we will be working with and I can organize at least one craft per country. I plan on making Thursdays our craft afternoon to work more closely with the culture and art of the country we are studying. I am very excited about Global Art and so are the kids. They have earmarked several projects that they want to try. We were only able to touch on some of the basic ones with our limited supply resources. There are some truly great craft ideas that reflect the history of the cultures! This is a book we will utilize much this upcoming year! Click on the banner below to see what other members of the Crew thought! Great way for kids to learn! Love that the book is organized by continent then by country. Really lets you travel the world and learn through fun activities. This is great! We are hoping to adopt from China in a few years so I am incorporating several different countries and activities in our lives as we prepare to be a multicultural family. I think it's really important for children to grow up with a broad sense of the world! This is awesome! My little ones love art!